There is a long-standing Judeo-Christian tradition of using animals to teach moral and spiritual lessons. Jesus used sparrows to illustrate God’s care for his creatures, and the book of Proverbs describes certain animals as wise. The saints John Chrysostom and Francis de Sales often used animals, both fantastic and real, as rhetorical devices in their sermons and writings. This rhetorical tradition found its most systematic expression in the medieval bestiary. 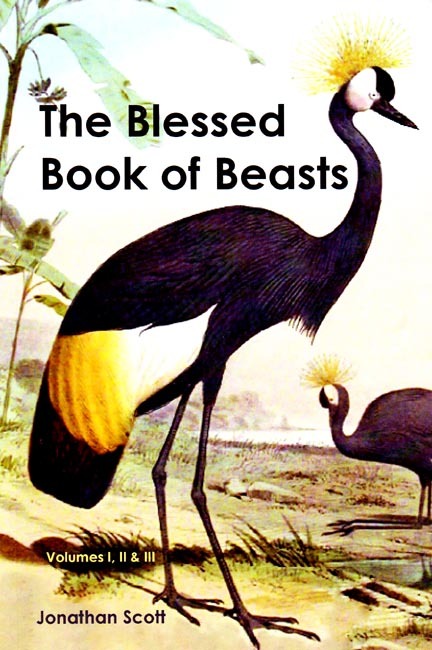 While today this mode of conveying spiritual truths is less popular, one author, Jonathan Scott, seeks to bring it back, having written the first bestiary to appear in quite some time. Designed to appeal to children, Scott’s book accompanies each beast with a verse from the Bible, a beautiful seventeenth-century engraving, and a lesson in verse about virtue and goodness. The book is divided into three volumes according to the categorization of beasts in the Creation account. This book is attractive and nicely put together, and should serve its edifying purpose well. Copyright 2014. Dimensions: 6 x 9 inches. Soft cover. 221 pp. My kids smile everytime I read them a verse from this book. It always invites a happy discussion on an animal, Scripture and virtue. Thank you for stocking this good book. I never knew there were over a hundred animals named in the Bible, and the Bible says some pretty cool things about them too! Animals like the Sparrow, Eagle and Donkey help lead us to God. Thank you Seton for stocking this great book!